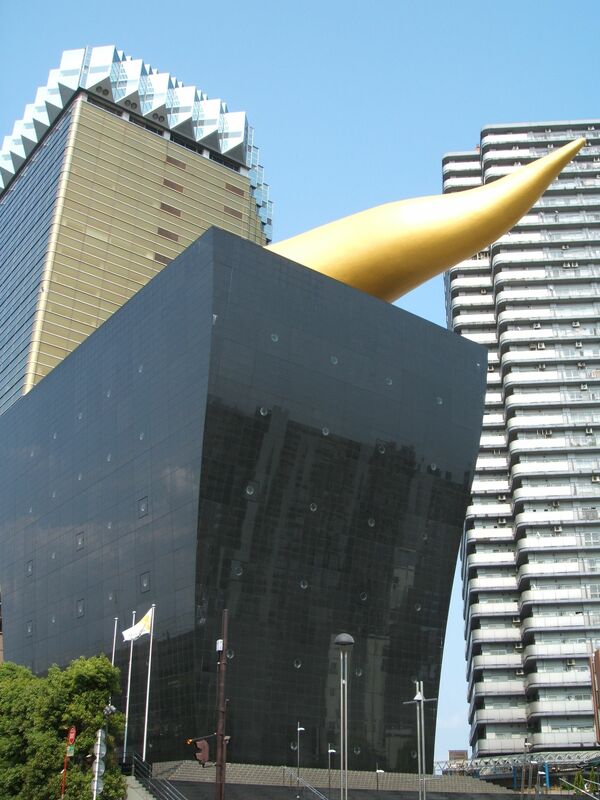 Beer brewers in Japan are always offering special beers. One of the most common is season beers for spring, autumn, Cherry Blossom season, and starting at this time of year…winter beer. Around this time last year, I bought Kirin’s winter beer…and today, I bought a case of Asahi 「冬の贈り物」 (“Winter Gift”) beer. Do beer brewers in your country sell “seasonal beers”? 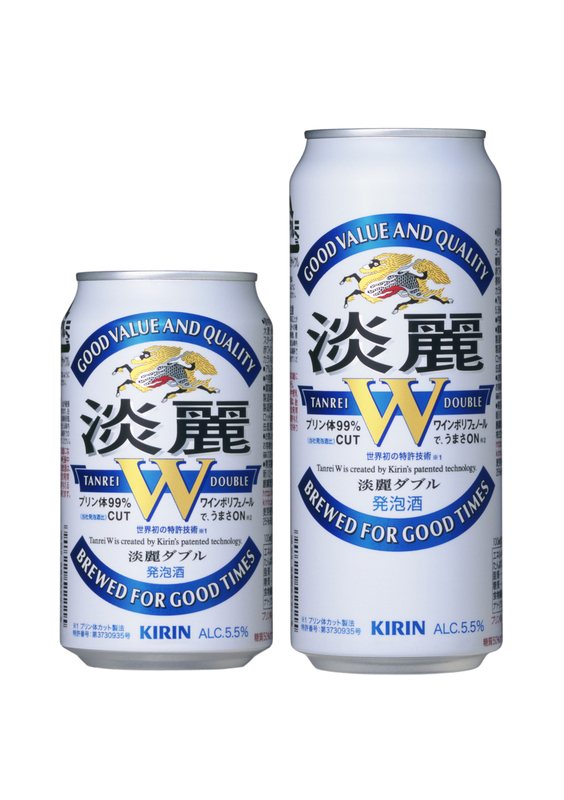 Do brewers outside of Japan sell 発泡酒 (low-malt liquor) that is similar in taste and appearance to lager beer…but cheaper? 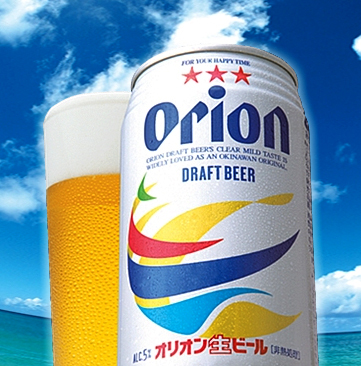 Have you ever tried a Japanese 発泡酒 (low-malt liquor)? What do you think of them? 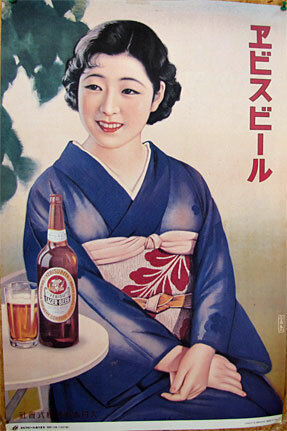 I’m sure that many countries have beer posters and advertisements that feature pretty women. I remember the Budweiser Beer “Bud Girls” ads in America. 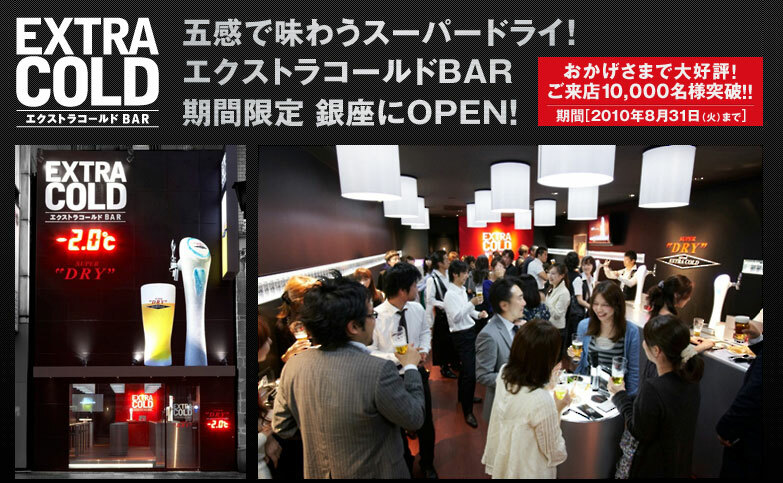 Budweiser Beer has "Bud Girls" in Japan, too. It’s interesting to see how advertising changes and evolves over time in a particular culture. Pre-World War II beer posters are quite fun to look at. They’re so different from more modern advertisements. 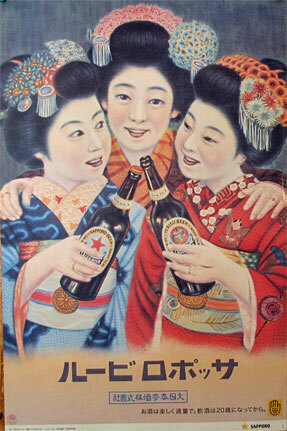 Sometimes Japanese 居酒屋 (pubs) and restaurants will have some of these old, retro beer posters on their walls. I like it when I go to a place that has them. 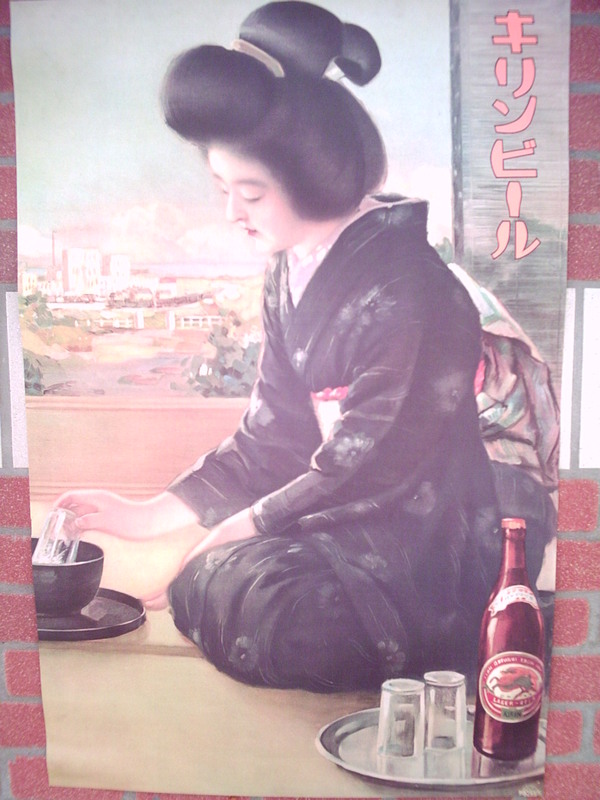 This one says 「サッポロビール」 ("Sapporo Beer") written from right to left. 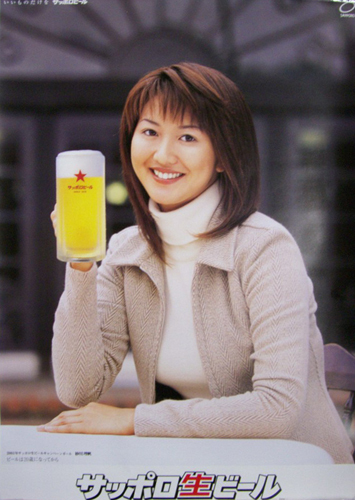 When I first came to Japan, it was very common to see beer posters in Japan that showed girls in bikinis holding a mug of beer. Nowadays beer posters with girls in bikinis can still be seen…but it seems to be more of the trend to have the models in the beer posters be more “conservatively dressed”. 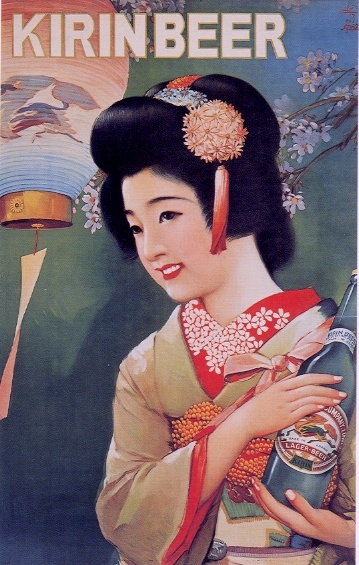 Beer poster for 「サッポロ生ビール」 (Sapporo Draft Beer). Beer posters are interesting, especially how they’ve changed over time…but what really matters is that the beer is cold! Today we went to a neighborhood festival that we usually go to every year. 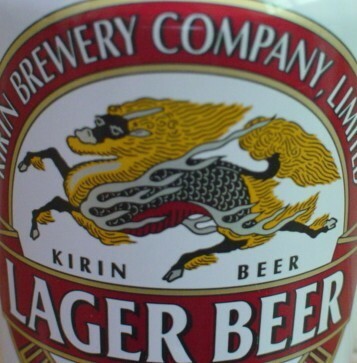 While we were there, I went to buy a beer…and I found a retro style can of beer by Asahi Beer, so I bought a can. It’s a re-issue of their “Asahi Gold Beer” in a can that looks like it did when that beer was sold in Japan fifty years ago. Asahi Beer is selling this beer for a limited time only in the special retro design cans to celebrate the 50th anniversary of Asahi Gold beer and also the 120th anniversary of Asahi breweries itself. The original Asahi Gold beer that went on sale in 1958 in Japan was sold in cans without any tab on the top of the cans! A can opener was needed to punch two holes in the top of the can to drink the beer! 1950's can of Asahi Gold Beer with no tab on top. This was also Asahi Beer‘s first beer sold in a can (rather than a glass bottle). Of course, the cans of this beer being sold today have the easy-to-open tabs on top. This is a good beer. I recommend buying some while they’re available. I have a collection of unique beer bottles and cans…I’ve added this one to my collection! 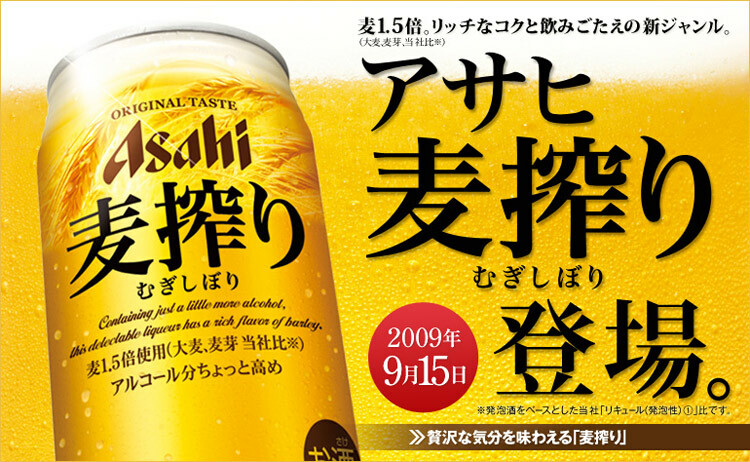 Last Tuesday, Asahi Beer released a new beer (actually a 発泡酒 (Happoushu*)) called 「麦絞り」 (which translates to something like “Extract Of Wheat”). 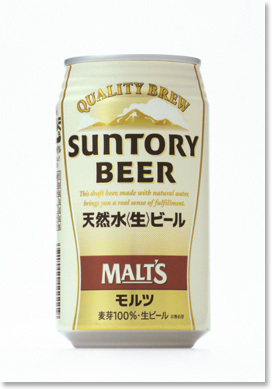 * (発泡酒 (Happoushu) is similar to Malt Liquor. It looks like beer and tastes nearly identical to lager beer. Some people don’t like them…but, just as with regular beer, some taste better than others. I think most of them taste exactly like beer. It says on the can 「アルコール分ちょっと高め」…which means “The alcohol is a little bit higher”. And it’s listed as “between 5.5 – 6.5% alcohol”. So, I bought this beer and drank it with dinner last night. It was good. I recommend it.